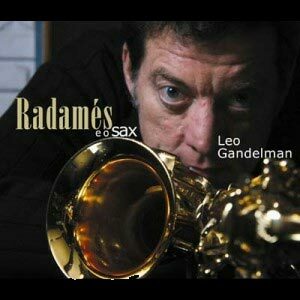 Radames and the Sax won the TIM prize in 2007 for “Best Instrumental CD” and “Best Musical Production” Radames Gnattali (Porto Alegre 1906/Rio 1988) was a major modernizer of Brazilian music in the twentieth century. Classically trained, was enchanted with choro in his youth and later found in jazz elements that would help him with the innovations. During this time he was a pianist capital, and was searching for the appropriate tools for his new ideas. The saxophone was one of them and in collaboration with some top players of the instrument – Luis Americano, Zé Bodega, Sandoval Dias and Paulo Moura – the composer drew a modern language for the Brazilian sax. “Radames and the Sax” summarizes these experiences and the repertoire can be divided into three groups. The first is with parts created for the tenor sax because of the admiration of Gnattali for Zé Bodega (“Bate Papo”) and Sandoval Dias (“Pé ante pé”, “Amigo Pedro”, “Brasiliana nº 7”). The first is considered the greatest Brazilian tenor and from him Radames portrayed a relaxed and full of bossa playing way. Sandoval on the other hand, was criticized by his colleagues for not caring about jazz, or cultivating his accent. It was precisely why, besides some choros, Gnattali dedicated to him the masterpiece that is “Brasiliana No. 7.” Originally composed for the tenor saxophone and the piano, the Brasiliana appears here in an arrangement found by Henrique Cazes on the National Radio sheet music archive and it waited almost half a century to be recorded. This piece blends virtuosity, sensitivity and balance in perfect proportions. The second repertoire are songs for the high sax dedicated to Luis Americano (“Serenata no Joá”) and Paulo Moura (“Valse triste”), and they show Radames at ease both with a traditional 1930s choro and a modern series of works he created for the album “Paulo Moura plays Radames Gnattali” from 1959. The third group is of composed choros to be played by the sax (Assim é melhor, A fumaça do meu cachimbo e Remexendo), “where the melody itself is structured to work well in this instrumentation. Summarizing decades of evolution of the Brazilian sax in a single work was only made possible by the passionate dedication with which Leo launched this project. As an instrumentalist, he emerged himself in the style, reclaimed the sounds never ceasing to be himself, going through the legacy of legends of the instrument, always at ease. From the soprano to baritone sax, solo or in suit with the scholarly rigor or the irresistible swing of the gafieiras, Leo Gandelman once again showed how good he is with the sax, how good he is with music and how Brazilian he is. Playlist 1. Bate papo (Radamés Gnattali) 2. Assim é Melhor (Radamés Gnattali) 3. Serenata no Joá (Radamés Gnattali) Brasiliana # 7 (músicas 4, 5, 6) 4. Variações sobre um tema de viola (Radamés Gnattali) 5. Samba canção (Radamés Gnattali) 6. Choro (Radamés Gnattali) 7. A Fumaça do meu cachimbo (Radamés Gnattali) 8. Pé ante Pé (Radamés Gnattali) 9. Remexendo (Radamés Gnattali) 10. Amigo Pedro (Radamés Gnattali) 11. Valsa Triste (Radamés Gnattali) 12. Amargura (Radamés Gnattali/Hermínio Belo de Carvalho) Leo Gandelman and the New Quintet The group debuted in 2000 with a project to recreate the legendary Quintet Radames Gnattali, group with which the maestro performed numerous renovating experiments in the universe of choro. To be a part of the New Quintet, Henrique Cazes invited musicians who for years had been researching the style. They are: Maria Teresa Madeira – piano Bachelor’s degree in piano and has a Masters of Music from the University of Iowa, she has more than 20 CDs devoted to Brazilian music. She was nominated for a Latin Grammy in 2003 for the album “Ernesto Nazareth.” She is an undergraduate professor in the Brazilian Conservatory of Music, ans has performed and given lectures throughout Brazil and in several other countries. Marcos Nimrichter – accordion He began playing the piano at the age of four and by the time he was fourteen he was already playing professionally. Besides being fully trained in classical piano, he has shown great versatility, working with jazz, choro, MPB and more. In 2002, he released his first album, combining inspiration and eclecticism. Omar Cavalheiro – Double-bass He has a bachelor’s degree in double bass from UFRJ and he is a teacher at the Villa-Lobos School of Music. He acquired a lot of experience working with Wagner Tiso, Francis Hime, MPB4 and Leila Pinheiro, among others. Of all his contributions in other artists’ albums we can highlight: “Retratos-Radamés Gnattali”, “Piazzolando ao vivo” and “Bach in Brazil”. Oscar Bolão – drums He was a student of the creator of a style of Brazilian drums, Luciano Perrone, who before dying personally delivered all his equipment to Oscar. He is a specialist in the rhythms of Rio, a subject that discuses in his method ” Batuque é um Privilégio”. As a teacher he has trained a whole generation of outstanding drummers. Henrique Cazes – eletric guitar and musical director A self-trained multi-instrumentalist, between 1980 and 1986 was part of Camerata Carioca where he worked with Radames Gnattali. In 1988, he began his solo career, releasing several albums. Is the author of the books “Choro do Quintal ao Municipal” and “Escola Moderna do Cavaquinho”. Has dedicated his time to producing albums, winning several awards, and the development of new projects. Formation: Sax, Accordion, Eletric Guitar, Piano, Acoustic Bass and Drums.